Handloading precision ammunition can be a tedious exercise in patience and attention to detail. It can also be a relaxing and rewarding hobby that turns out nearly identical rounds of impeccable quality. 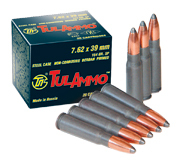 Precision shooters, especially benchrest shooters, value high quality ammunition. 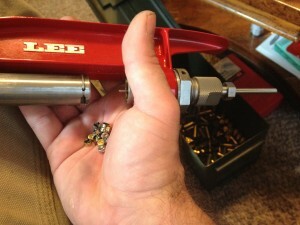 In many cases handloading is a prerequisite for benchrest because the calibers used are not commercially manufactured. I don’t shoot 6mm BR Rem. or any other ammunition that I can’t find on the store shelves (excluding .22LR, but here’s hoping that shortage doesn’t last much longer) yet I still appreciate a well made cartridge. 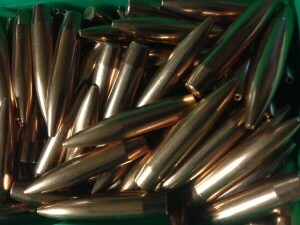 Premium rounds, even in common calibers such as .308 or .270, command prices well in excess of $1.50 per round. You could go to the store and buy it off the shelf, or order it online, but I find the pride of turning out the rounds themselves to be well worth the time and effort. Nestled down in the back of the garage at my workbench is my meditation zone. It’s a quiet place, free from distraction and noise. There’s no TV, and I leave my smart phone in the house. The accommodations are spartan. Concrete floors, a simple stool, and a large unfinished wooden workbench topped with various presses, bins, scales, tumblers, trimmers, a work light, and various other accoutrements are all that occupy this space. My wife has her art room, and I have my garage. It’s here in my little refuge where I can still my mind and focus on the little things. 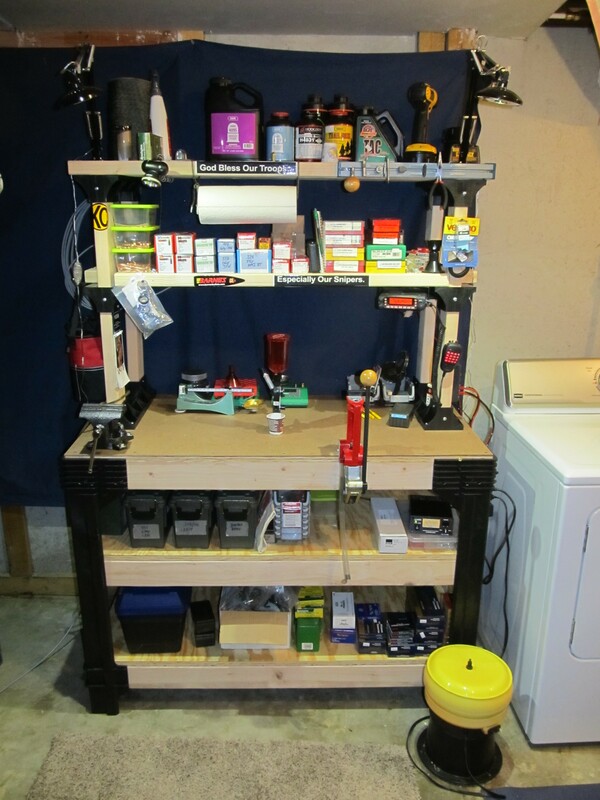 I’ll start by setting up the press and organizing my components and tools for whatever caliber is being loaded. Today we’re doing 6.5×55 SE loads. First the bullets are sorted. One by one each Sierra Match King HPBT is weighed and measured on the Frankford Arsenal scale. Ideally each one should be exactly 140 grains and measure 0.264 inches in diameter. In reality, there is a bit of variation, however slight. 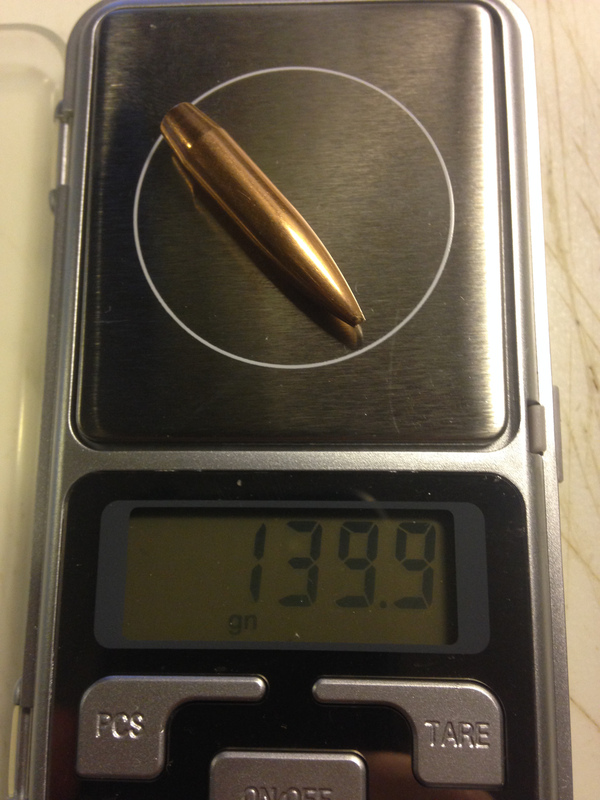 Bullets weighing 140.1 grains go in one bin, 140.0 in another, and those weighing 139.9 go in yet another. This task complete, it’s time to remove the brass that have been getting cleaned and polished in the tumbler. 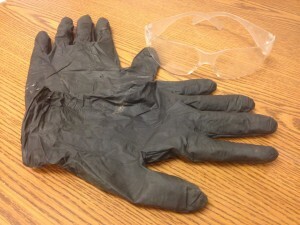 Cases that were split or cracked have already been discarded. The corncob media mixed with a bit of polishing compound has left the remainder gleaming. Once again it’s time to visually inspect every case. Those that show any sign of damage or overpressure are discarded. Check the thickness of the brass at the neck with a digital micrometer. 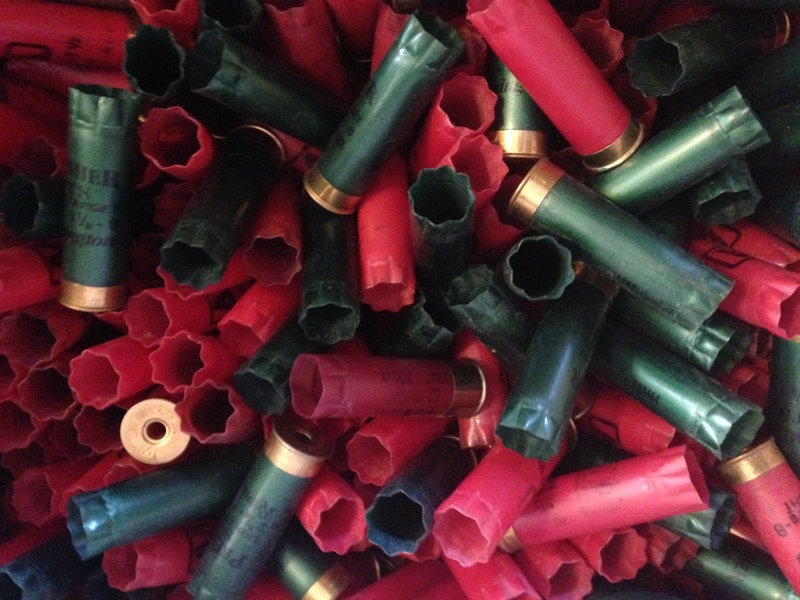 Brass that is too thick, usually old military brass, is set aside to be loaded for plinking. Brass that is too thin is discarded. Each case is then rolled across the RCBS lube pad, essentially a repurposed stamp pad impregnated with case lube, using just enough pressure to get a thin coating on the case. Too much pressure means too much lube, and that can dimple the brass. Thus properly lubed the brass is run through a full-length decapping and resizing die. Turn it 90° in the shell holder. Run it through the die again. Inspect the brass once more for any dimples or other damage caused or revealed by resizing. Now it’s time to check the primer pocket and flash hole. Clean and, if necessary, ream the primer pocket. Then the digital calibers come out again, along with the case trimmer. In this case we’re trimming a little long: a short distance between the bullet and the rifling helps to improve accuracy. The micrometer shows 2.168 inches. That’s a little too much, so into the trimmer it goes. Measure again, and then trim a tiny bit more. Finally the digital readout indicates 2.160: the perfect case length for this chamber. This process continues over and over through case after case with each one getting chamfered and deburred. The inside of the throat and neck is meticulously cleaned and lightly lubed before the brass is set into the shell holder. Once all of the brass has been prepared in this manner each one is carefully fitted with a CCI No. 200 large rifle primer. Every primed shell is checked for proper primer depth. Primers that have been mashed sideways or have an improper depth are removed and discarded in a tin can. The 49.0 grains of Alliant’s Reloader 19 powder is next to be added, but a simple powder drop will not suffice. Instead a scoop and powder trickler allows precisely the correct amount of charge to be loaded into each round. This, combined with the short leade, should give just enough pressure to launch a bullet at just over 2,900 feet per second. Those bullets, of course, are next. Only the ones from the bin marked “140.0 grains” will be loaded. The rest will be used for plinking. Round after round is carefully seated and the overall length checked before the bullet is crimped into place in another die. Slowly the ammunition case fills with perfection. Each round is identical to the other, or at least as close as is humanly possible. Finally done, I stop to inspect my handiwork. My eyes are sore, and my back too, but my mind is still and I am satisfied. The easy answer is to simply tell them to buy a single-stage press and leave it at that. The problem is that there are dozens of single-stage presses out there and each has its own advantages and disadvantages. Cost is, naturally, one of the major deciding factors when choosing a press. For that reason we wanted to take a close look at what is quite possibly one of the most versatile and inexpensive presses on the market: Lee Precision’s Breech Lock Hand Press. 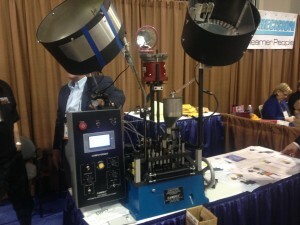 Unlike most other single stage presses, the Breech Lock Hand Press does not mount to a bench. In fact, it doesn’t require a bench at all. As its name implies this press can be hand-operated nearly anywhere. Weighing in at a mere 28 ounces Lee Precision’s Hand Press is easily portable. In fact it’s so compact that the press, dies, bullets, brass, and all other accessories you need to load a cartridge can fit inside a .50 caliber ammo can. That’s actually what I use to store and carry my own Hand Press. Experienced handloaders who have access to a range where they can set up a chronograph and spread out their accessories will love the convenience of the Hand Press. I don’t have access to my own personal range just outside my work shed, but I can tote Lee’s Hand Press down the road to a local private range and develop my loads right there on the spot. This makes the process of working up to your final load much quicker and easier than loading a variety of cartridges at home, firing them at the range, and then taking your notes home for further development. Many ranges will not allow handloads at all, much less permit shooters to load them site, so always check with the management first before you break out the powder and scale. 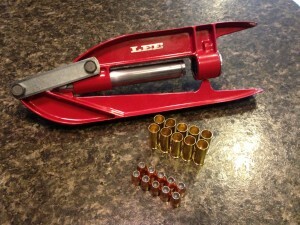 For someone who wants to start reloading on a budget, this tiny press is a boon. The Breech Lock Hand Press kit that Lee advertises has an MSRP of $68.00, but you can probably find it retailing for as low as $49.99. The total package includes a funnel, lube and a single Breech Lock Quick Change bushing. Additionally the kit comes with the Lee Ram Prime. Add in a reloading manual, some dies, a shell holder, clean brass, primers, bullets, powder, and a scale and you have all of the basics you need to begin handloading. The Breech Lock Quick Change Bushing utilized on the Hand Press offers an advantage often only found on more expensive presses. Once you have your dies set at the proper depth and locked down, using the Quick Change Bushing there’s no need to ever have to reset them. Simply remove the bushing by pressing the round locking pin on the press and remove the busing and die as a single piece. With two more bushings, available as a set of 2 from Lee for only $9.98, you can have a complete 3-die set locked in at the proper setting. Naturally, the Hand Press is not without its drawbacks. Leverage is incredibly important, particularly when resizing brass. Even when using clean and well lubed brass, it can take a significant amount of force to close the Hand Press. Bench mounted presses typically have long levers with a large round knob to reduce the amount of muscle power required for each operation. Because the Hand Press places a premium on size, this mechanical advantage is much reduced. After depriming and resizing 100 rounds of .44 Magnum brass I could definitely feel the burn in my bicep and shoulder. My wife, by comparison, was simply unable to close the press at all. Given the fact that straight-walled ammunition like .44 magnum are much easier to resize, I have to conclude that using a full-length resizing die on rifle cartridges with prominent shoulders is probably not the best use of this press. It can surely be done as Lee Precision’s Hand Press will handle cartridges with an overall length of up to 3.65 inches, but unless you’re a powerful weight-lifter it’d likely wear out your arms in short order. 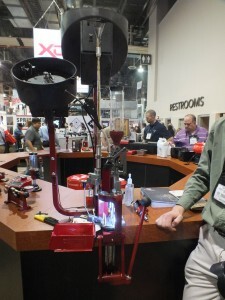 Are you ready to get started handloading your own ammunition without breaking the bank? Perhaps you’re an experienced reloader looking for something that is easily portable, or simply don’t have room in your apartment or loft to store a larger press. Whatever the reason, Lee Precision’s Breech Lock Hand Press is an inexpensive investment that will fit your basic needs.